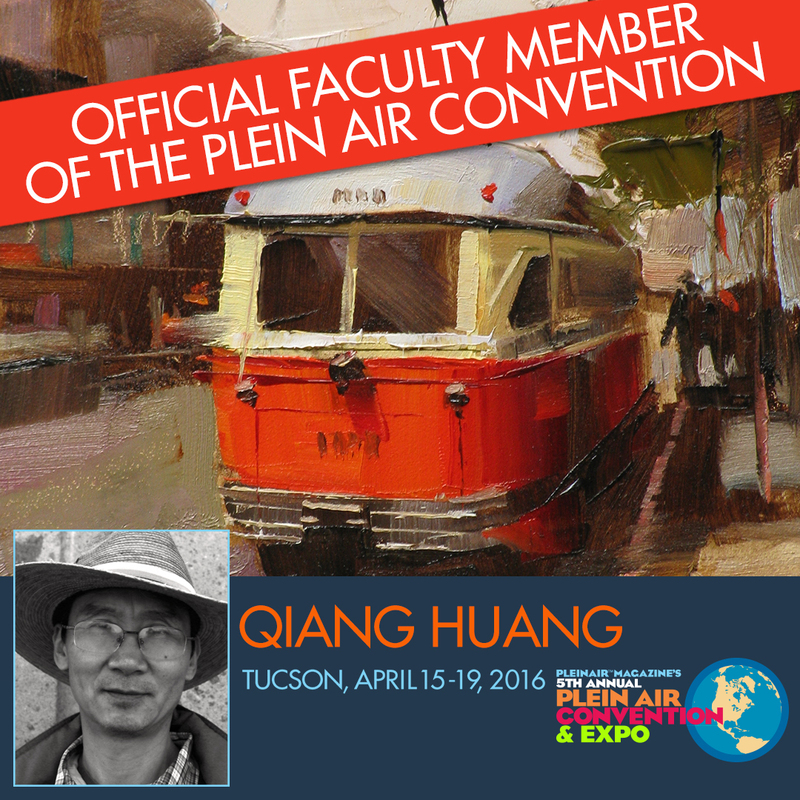 I am so excited to be an official faculty member of the 2016 Plein Air Convention & Expo - #PACE16 in Tucson April 15-19. This is the World’s Largest Gathering of Plein Air Painters. Join us in Tucson for the time of your life and, if you register now, you’ll save $200 off of the regular convention price. To find out more about PACE, head on over to www.pleinairconvention.com – looking forward to see you in Tucson! I have been painting at the same place again and again. I don't know why I am doing this exactly. It maybe because I don't feel enough control on handling the colors for plein air painting. I see too much, but my hand can only do a very small portion of it. I hope I will progress and get to a higher level by keep going to this location again. You will see more to come. Another plein air at the same park, but at a different location. The new limited palette works very well. The painting looks harmonious and colorful. I am happy to include pure (i.e. no man made structures) landscape painting into my portfolio. I went to the same place again, and did my third plein air. I feel I really need to do several paintings at the same location. I am a little more comfortable now. I did the second plein air painting at the exactly same location. I wanted to practice with this new limited palette more. It was amazing of seeing so much colors at this location. I used to dislike pure landscapes. I used to think that I must put some manmade structures, like a small house, in the painting. Now I feel I start to see the beauty of pure natural landscapes. My skill is not mature yet, but at least I have seen something different than before. I went to plein air painting by myself yesterday. It is also my first non-demo painting. When I am not teaching, I shift into my research mode and try to improve myself. The research topic with this painting is trying to develop a workable limited palette for plein air painting. I used 5 colors to do this painting: cad yellow lemon, quinacridone rose, manganese blue, ultramarine blue, and white. I think the painting has proved that this palette works. I can get all most all the colors I need. "Demo at Houma 2016 3"
The Third Demo I picked a theme: Mardi Gras. The local artists brought items related to Mardi Gras and I formed this composition. It was quite a challenge doing something new, but it was quite enjoyable as well. I had a wonderful time of painting the Mardi Gras doll, the green, purple, and gold color beads, and the King cake baby. I wish I could stay in New Orleans a little longer and see the Mardi Gras 2016. I heard it can be quite a experience. Well maybe in the future. This is my second demo. Felt a little empty on the right hand side. So I put my linseed oil bottle there to balance out. I spent quite amount time on the pewter pot and the vase in the far field. Relatively, I did not spent too much time on the rose. “Demo at Houma 2016 1"
I just came back from Houma Louisiana. I really enjoyed the Cajun country. I want to thank the Terrebonne Fine Art Guid for organizing my workshop and thanks to all the Louisiana artists for coming and painting with me. This is my first demo. So many of my workshop students have asked if I had an instructional DVD available that I decided to go ahead and create one. 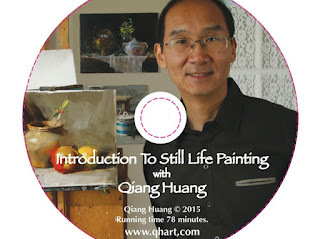 This is the first "Introduction to Still Life Painting". It follows my usual teaching format which will be familiar to my students, reinforcing my five step painting process. Please see the preview on YouTube. The video is available for purchase on my website. The last day of the workshop, I did this monochromatic doorway from one of my photos I took in China. I used only black white and transparent oxide red, and mainly used a palette knife to paint this one. I really like this new direction and want to spend more time to develop this style. The third demo is about flowers. I painted a few roses as usual. I always feel the leaves is harder than the flowers. I still need more practice on that. The second demo was about the glass and metal. They are quite mysterious. Majorly I worked only on the edges and highlights. The solidity of those objects are very illusive, but that was mainly the fun of painting them. "Demo in Austin 2016 1"
I can't believe that the year of 2015 is gone and 2016 is right here. I have started my first workshop teaching right here at home. For organizing this one I really want to thank my wife Song, and thanks to all Texas artists for attending. I also want to thank my son Jonathan for preparing meals for the workshop and Jane Frederick for her assistance. The first demo intends to introduce my process. I like the brass pot. It has some intricate details.